Editor’s Note: This article was originally published in the Berlin Daily Sun. Thanks to both the Sun and writer Edith Tucker for allowing republication of this story. RANDOLPH — Last Saturday’s annual Randolph Community Forest (RCF) Day looked to the future and also honored an important player in the 10,000-plus-acre Forest’s ongoing partnership with the U.S. Forest Service by officially thanking recently-retired Androscoggin District Ranger Katie Stuart of Shelburne. During the field trip segment of the day, town moderator David Willcox presented Stuart with a plaque that highlighted her collaborative efforts on road maintenance and other significant projects. 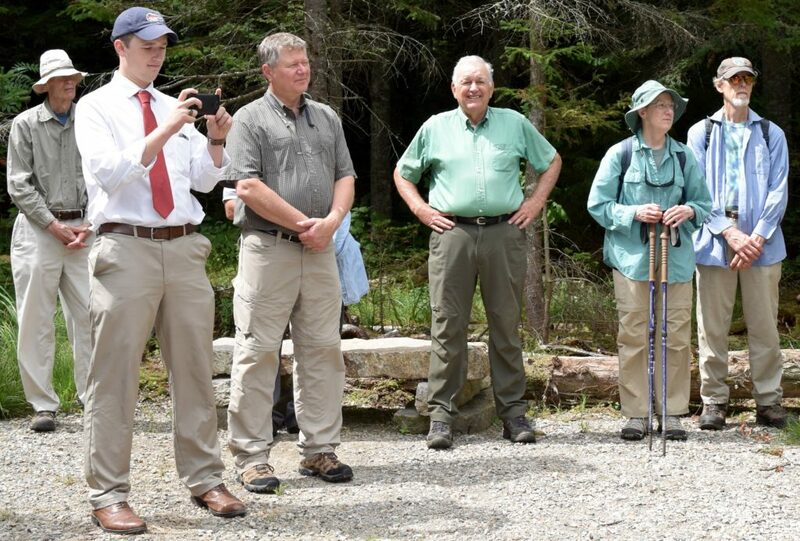 The brief ceremony was held at the water’s-edge of the non-motorized boat access to the remote Pond of Safety, the headwaters to the Upper Ammonoosuc River, reached from Ingerson Road, off Route 2 in Jefferson. Stuart recognized that the steep, muddy and hard-to-navigate path to the Pond was keeping away many anglers and outdoor enthusiasts, and she spearheaded the successful application for a USDA Two Chiefs Drinking Water Quality Improvement Partnership grant that helped pay for the graded walkway and enlarged parking lot. District 1 state Senator Jeff Woodburn of Whitefield presented Stuart with a Senate proclamation. 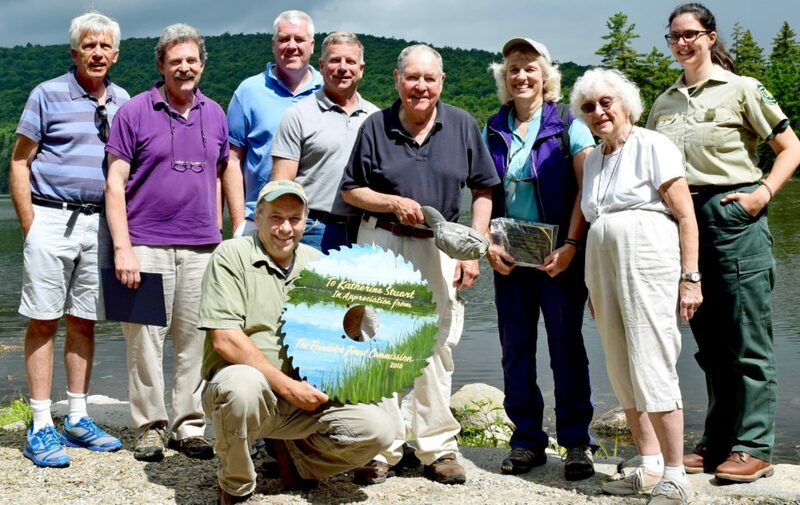 Chairman John Scarinza presented Stuart with a saw blade, painted with a scene of the 10-acre pond, on behalf of the Forest Commission. WMNF Supervisor Tom Wagner said that Stuart’s collaborative efforts helped to meet the needs of the local communities in her District, setting a very high standard for developing working relationships. He said, “We’re the People’s Forest.” Wagner also announced that Stuart, who just retired after serving a decade as the Androscoggin District Ranger, would be recognized in September in Washington, D.C., with the Abraham Lincoln Honor Award for Enhancing the Economic Vitality and Quality of Life in Rural America, one of the most prestigious departmental awards. Stuart thanked everyone for the kudos, but pointed out that her predecessor, George Pozzuto of Milan, had set the stage. “I got a good ride,” she said modestly. The Pond’s name refers to the four American Revolution patriots who, after being captured, were released by the British after they pledged they would not again take up arms against the King. The men sought refuge at the remote pond to ensure they would not be labeled as deserters. Some of their descendents live in Jefferson. The 3,200-acre Pond of Safety property that’s been part of the White Mountain National Forest for 15 years provides the only link of protected land between the WMNF’s Presidential Unit and its northern Kilkenny Unit. Earlier that morning, nearly 50 people crowded into a small meeting room in the Randolph Town Hall be updated on the Dirt to Trees to Wildlife program which has nine partners: the RCF, Natural Resources Conservation Service, USFS, Wildlife Management Institute, NH Granite, Northern Young Forest Initiative, NH Fish & Game, The Nature Conservancy, and UNH Cooperative Extension. Wildlife biologist John Lanier and county forester Brendan Prusik, both of Columbia, explained that the complex contracts are still being drawn up for multiple signatures. The program is designed to make it simpler at a specific location where a specific soil type exists to pinpoint which species of trees would grow optimally, allowing foresters to see which species of desired birds and mammals could be encouraged through a long-term timber-harvesting prescription or plan. This could sometimes mean reallocating a number of units to a different type of wildlife habitat, including the one that once was naturally in place before timber companies’ met their need for pulp. The RCF provided the original $30,000 that was used to leverage a $105,000 USDA grant, plus an additional $75,000 match, primarily in-kind services. 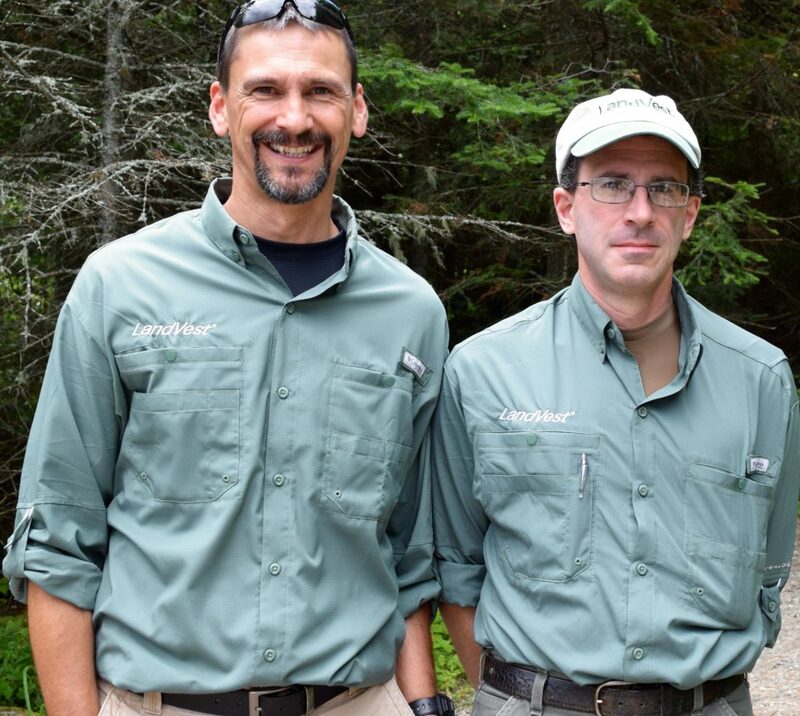 The RCF’s new LandVest, Inc. forestry team — David Degruttola of Bethel, Me. and John Steward of its West Stewartstown office — later used two stops in the woods along Pond of Safety Road to show how they might recommend managing younger-aged forests to improve timber quality, overall forest health, and maintain and enhance wildlife habitat. After a public selection process, Landvest was retained in May to help manage the RCF’s natural resources. Scarinza reported on the Forest Commission’s maple-sap-tapping study that led to the RCF signing a long-term lease with Fuller’s LLC of Lancaster. Fuller’s has just poured a 40- by 80-foot concrete foundation for a sugarhouse on Route 2 in Jefferson near the Randolph town line, where windows and doors were previously sold. The steel storage tanks that will be placed there will be gravity-fed from beautiful maple stands that ultimately could support some 25,000 to 30,000 taps and 200 miles of tubing. Given the many changes in the timber industry, including more paper mills shutting down in Maine, maple syrup production is designed to provide market diversity to help the RCF maintain a regular cash flow. If all goes as planned, the RCF will be one of the state’s larger maple operations, and UNH Extension Field Specialist Steve Roberge in Cheshire County and researchers at UVM’s Proctor Maple Research Center will do research on how tapping 10-inch diameter maples affects their growth and hardiness. This out-of-the-way section of the RCF, tucked behind the Water Wheel restaurant, has been badly affected this year by forest tent caterpillars. Although this native pest’s name includes the word “tent,” it actually forms a silken mat on a trunk or branch, where it congregates when at rest or during molting periods. The maple trees, however, are expected to have sufficient time this summer to put out a second set of leaves. Eastern tent caterpillars make tents.